"Finish the book, Bobbi!" 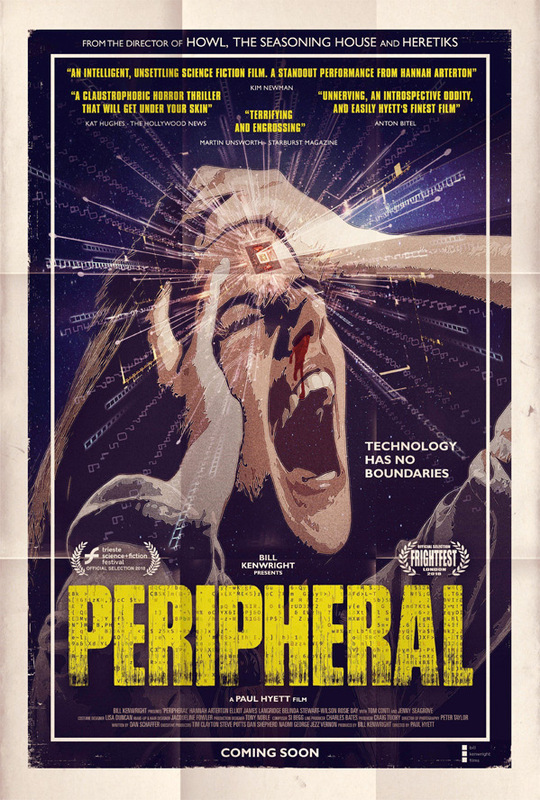 Amp International has unveiled a teaser trailer for a wickedly weird sci-fi horror thriller titled Peripheral, from director Paul Hyett (The Seasoning House, Howl, Heretiks). The film is about a young writer named Bobbi Johnson struggling to finish her second novel. She installs an artificial intelligence into her home to help her finish, but it takes over her mind and manipulates her work to suit its own nefarious ends. Hannah Arterton stars as Bobbi, along with a smaller cast including Tom Conti, Rosie Day, Jenny Seagrove, and Elliot James Langridge. I honestly don't even know what to make of this - there's so many weird things happening and so much funky imagery in this trailer it's hard to make sense of it. But I guess I will admit: I am curious about this. A little bit, perhaps? Have a look for yourself. Bobbi Johnson is a young literary sensation facing her difficult second novel. Already dealing with a crazed stalker and her junkie ex-boyfriend, Bobbi is convinced by her publisher to use new smart editing software and finds herself going head-to-head with an artificial intelligence determined to write her book for her. As the machine manipulates her work to suit its own nefarious ends, Bobbi begins to realise that she is being controlled in ways far more sinister than she suspected. She may, in fact, be a pawn in a conspiracy of social mind control. Too far down the rabbit hole to turn back, Bobbi must keep writing, fighting her own addictions and hallucinations as she rushes to beat her deadline without selling her soul in the process and becoming a cog in a monstrous machine. Peripheral is directed by filmmaker Paul Hyett, an FX makeup artist who has also directed the films The Seasoning House, Howl, and Heretiks previously. The screenplay is by Dan Schaffer. No official release date is set - stay tuned. First impression?